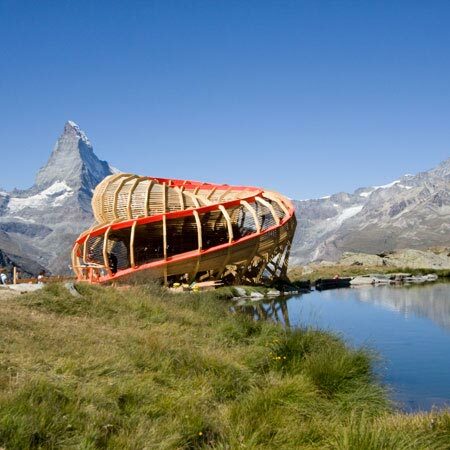 Los estudiantes del estudio de ALICE en la Escuela PolitÃ©cnica Federal de Lausana han desarrollado una estructura de madera para la observaciÃ³n del entorno junto a un lago en Zermatt, Suiza. 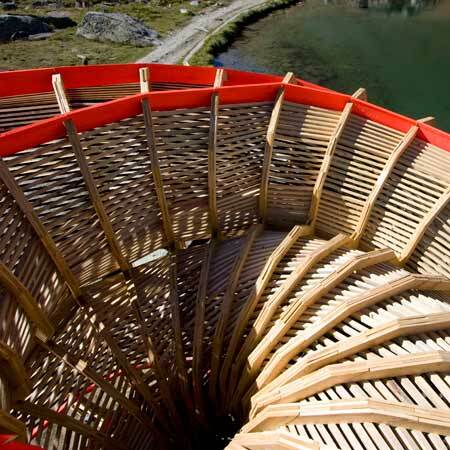 Llamado Evolver, la estructura consta de 24 cuadros de madera dispuestas formando un tubo que los visitantes pueden moverse a travÃ©s de ella, viajando 720 grados en torno al eje de la estructura antes de llegar de nuevo al punto de inicio. Vistas del paisaje circundante que estÃ¡n enmarcadas por rendijas entre los soportes. AquÃ­ hay mÃ¡s informaciÃ³n de los estudiantes: -- Evolver Evolver es un artefacto arquitectÃ³nico que interviene en el panorama circundante de Zermatt. Fue diseÃ±ado y ejecutado por un equipo de estudiantes de 2 Âº aÃ±o a partir del estudio de Alice en la EPFL en Lausanne, Suiza. En un esfuerzo por aprovechar al mÃ¡ximo los puntos de vista amplios y sorprendentes del sitio, el proyecto se encuentra estratÃ©gicamente junto al lago Stelli a una altitud de 2536m. Su estructura se compone principalmente de una sucesiÃ³n de 24 bastidores de soporte giratorio configurando un espacio cerrado que invita a entrar a los visitantes. Avanza a travÃ©s del espacio, un oculto, pero ininterrumpido 720 Â° de movimiento se estÃ¡ deshaciendo a lo largo de un panorama transformado. 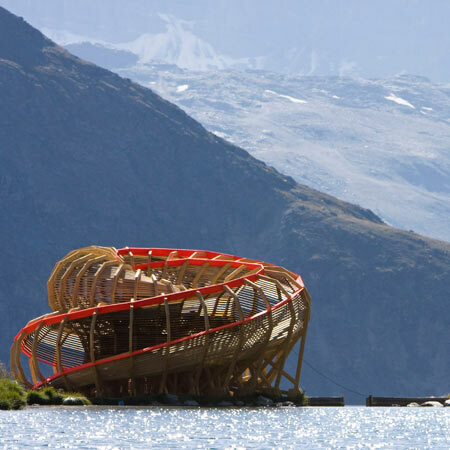 Students of the ALICE studio at Ecole Polytechnique FÃ©dÃ©rale de Lausanne have built a wooden structure for viewing the surroundings next to a lake in Zermatt, Switzerland. 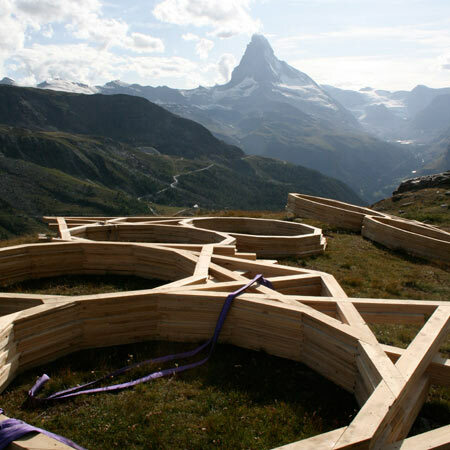 Called Evolver, the structure consists of 24 wooden frames arranged to form a tube that visitors can move through, travelling 720 degrees around the structureâ€™s axis before arriving back to the start again. 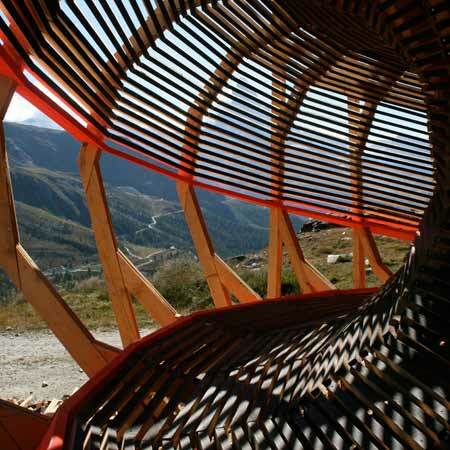 Views of the surrounding landscape are framed by slits between the supports. 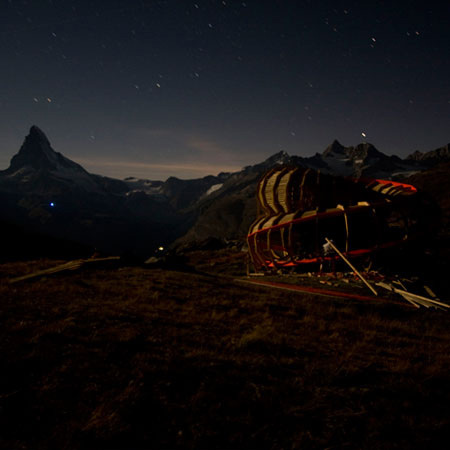 Hereâ€™s some more information from the students: â€“ EVOLVER Evolver is an architectural artefact intervening on the panorama surrounding Zermatt. 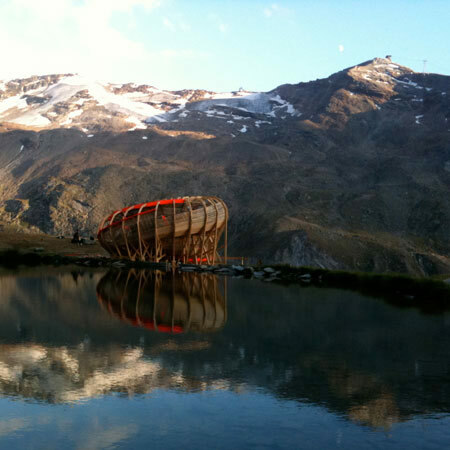 It was designed and executed by a team of 2nd year students from the ALICE studio at the EPFL in Lausanne, Switzerland. 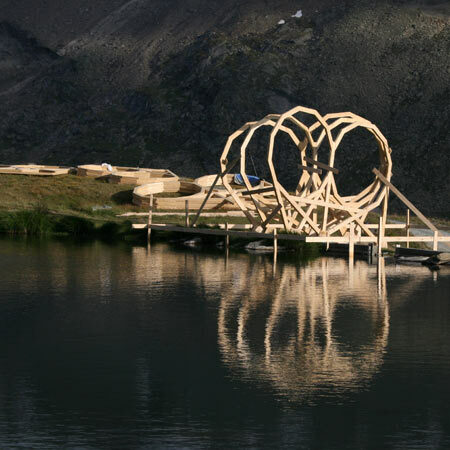 In an effort to take full advantage of the siteâ€™s extensive and astounding views, the project sits strategically next to the lake Stelli at an altitude of 2536m. Its structure mainly consists of a succession of 24 rotating frames supporting an enclosed space that visitors are encouraged to enter. As he or she progresses through the space, a concealed but uninterrupted 720Â° movement is unravelling along a transformed panorama. This transformation occurs while inside a person is moving along a selective string of openings only to be caught peeling off a sequence of unexpected views from the original landscape. Wobbling below and above a distant horizon, ground and sky have been reorchestrated into an orbiting panorama by a journey that has already culminated to where it started: A loophole on the skyline.